Summer is in the air and, now that the days are warmer, it’s time to get back into the garden and plant flowers so their colourful displays can be enjoyed throughout the summer and Autumn months. For speedy results, our large metal garden planters will make a dramatic statement in your garden. They have the timeless look of traditional lead planters and can freshen up your garden with instant displays of vibrant plants. Built to withstand the damaging effects of weather, soil and water, they are a lighter, low maintenance alternative to heavy clay pots. Unlike wooden planters which will eventually rot, the zinc galvanized steel finish ages gracefully, resulting in a beautiful weathered patina. 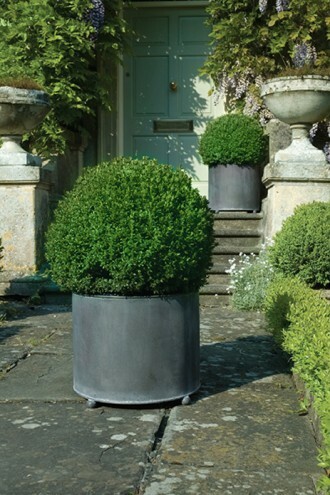 Our large round planters are generous enough to hold sumptuous arrangements of mixed planting or bold topiary. Choose colours that will complement the other visual elements in your garden. With the right choice of plants, your planters can look good all year round. Arrange planters in a way that enhances their surrounding area the most: around doors, along steps or paths, adorning or hiding an empty space or wall. A stunning array in a planter can also transform a terrace into a colourful and inviting part of your home. It’s hard to go wrong with attractive planters filled with blooming flowers.